iMovie is a video editing software created by Apple that is available for the MacBook and it is a web-based application available on the iPhone and iPad. ​The application allows users to create movies and trailers. 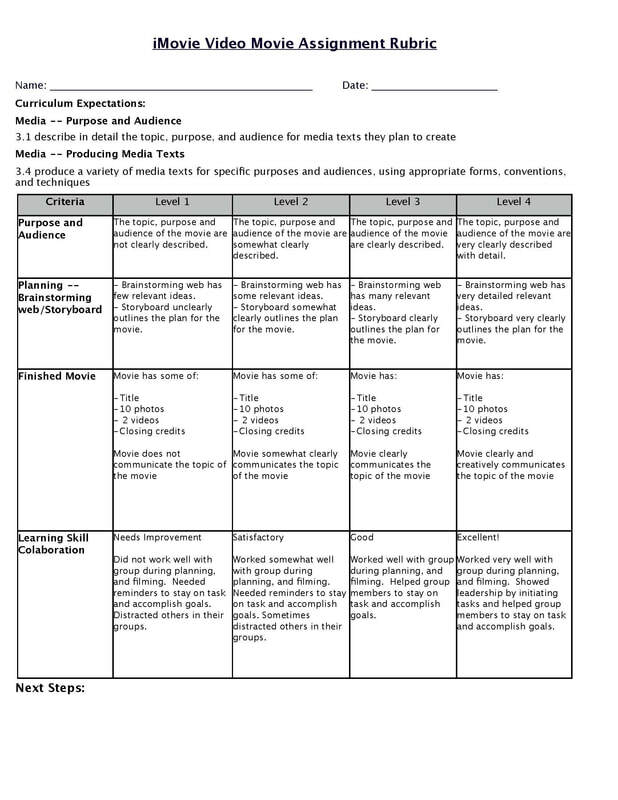 More importantly, it promotes student engagement and allows students to demonstrate knowledge and build media communication skills. News Report - Take advantage of the picture-in-picture effect to simulate a broadcast desk. Here is an example of a news report video. Stop Motion - Combine a series of still images that show minimal changes over time. Students can create characters out of Play-Doh and use the iPad to take pictures that can be inserted into a project. Here is an example of a paper stop motion video. Green Screen - Have students create a green screen to change the background of a setting to make it appear the project was recorded in a foreign location or during a particular season. Here is an example of a green screen being used for a news report. Whiteboard Animation - Use a tripod to aim the camera so it will not move and use dry-erase markers and add a narration to your video. Here is a blog on how to create these videos. Video Blog - Students can create a video blog to share what they have learned throughout the education process. Can be used as an exit ticket too! "Snap Chat" Style Video - Short and to the point video under 10-seconds in length. 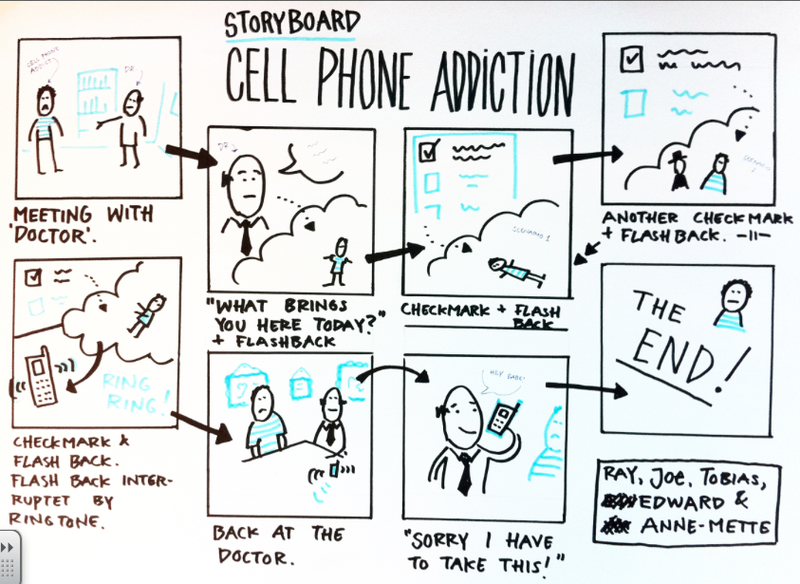 A storyboard is a graphic representation of how a video will unfold, shot by shot. ​It includes a sequence of drawings, typically with some directions and dialogue, representing the shots planned for a video production. Think of it as sort of a comic book version of your script. 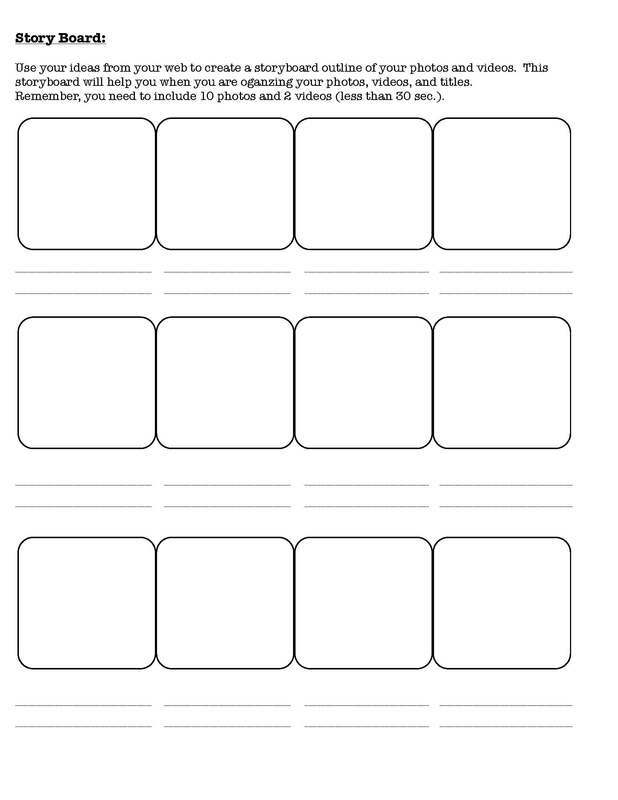 As part of the writing process, it is critical that students draft a storyboard before they begin recording. 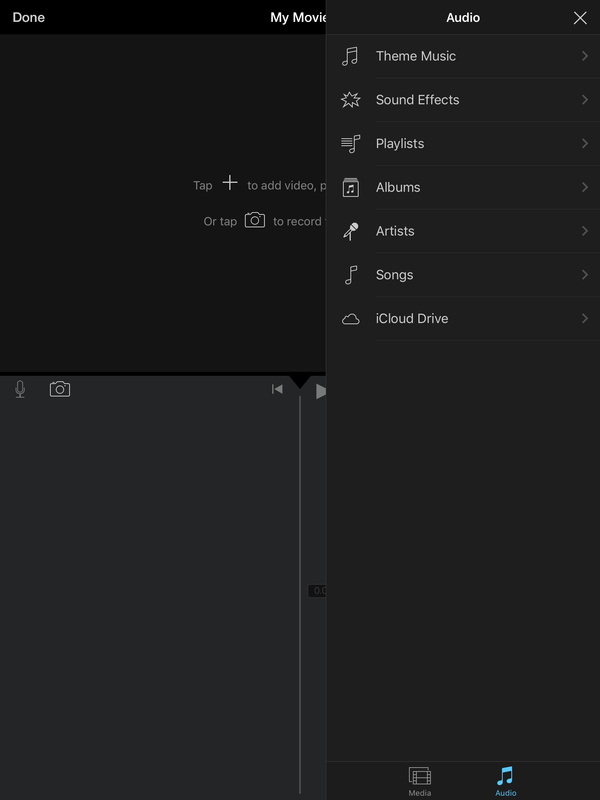 With the iPad turned on, locate the iMovie application icon, then click on the icon once. You may need to swipe the iPad screen until you find the purple coloured iMovie icon. If you are unable to locate the icon you will likely need to download the icon from DP Apps. 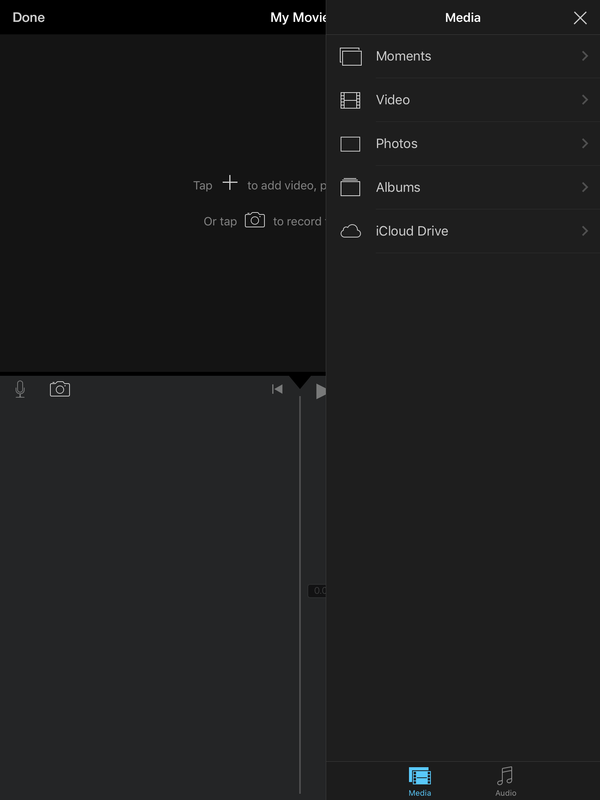 The iMovie home screen has three main tabs at the top of the screen: Video, Projects and Theater. The first tab, Video, displays all video clips that are stored on the device. 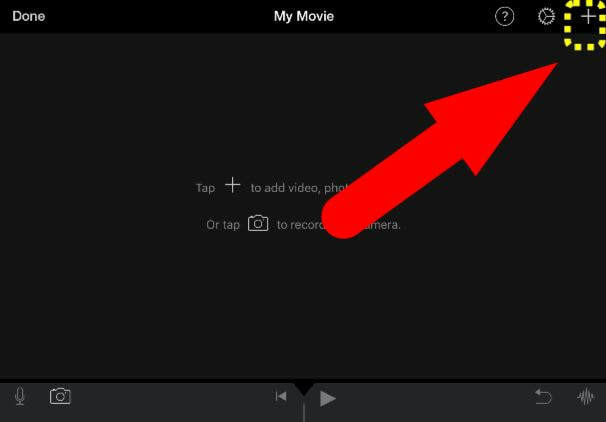 Any videos recorded with the iPad will automatically be stored under this section. The second tab, Projects, is where you will go to create a movie project or where you will go to find a project that you have already created are in the process of editing. The third tab, Theater, is where your finished movie project goes after you have "exported" it. You can watch the finished project from your device in this tab or you may choose to stream it to an Apple TV. From the home page of iMovie select the second tab titled Projects (located at the top of the screen). Then below the top tabs you should see a square box that reads "+ - Create Project". Tap on the icon once. You will have the option to create a new project in the form of either a Movie or a Trailer. A Movie allows the user the option to combine videos, photos, and music to make a movie. A Trailer allows the user to follow a template to create a Hollywood-style movie trailer. Tap on the Movie icon on the left-side of the screen to select the Movie option. The Moments page will then appear. This page will show all videos and pictures that are currently stored on the device. Any media that you wish to include in your project you can select by tapping. A blue circle with a check-mark will appear instantly on the media after you tap it. After you have finished selecting all the media you wish to include in the project, tap on the "Create Movie" tab (bottom of the Moments page). Note: You do not need to select all of the media you wish to import into your project at this time. You can always add later. Instructions to follow. Tip: Images that have a small camera icon in the bottom left corner and a number in the bottom right corner (refers to the length of the video clip) are videos. Images without the camera and number are photo images. The image below highlights the playback monitor area. ​It will display the video at the playhead in the timeline. The image below highlights the timeline area. This is where you build and edit your project. 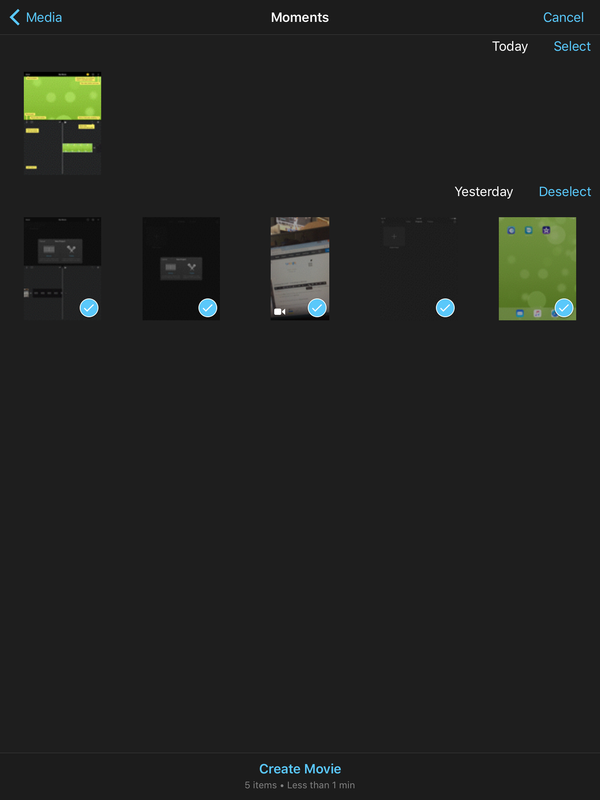 Videos and images will appear as image thumbnails. Audio clips, such as background music, narration and sound effects, appear as thin bars at the bottom of the timeline. A theme is a collection of titles and transitions designed to enhance the look of your movie. To set the a theme for your movie, tap the Gear button in the top right corner to open the Project Settings. You will then be prompted to select one of five themes: Modern, Bright, Playful, Neon, Travel, Simple and News. You can switch the Theme Music on or off. You can also set your project to fade in from a black screen and fade out to a black screen as well if you wish. 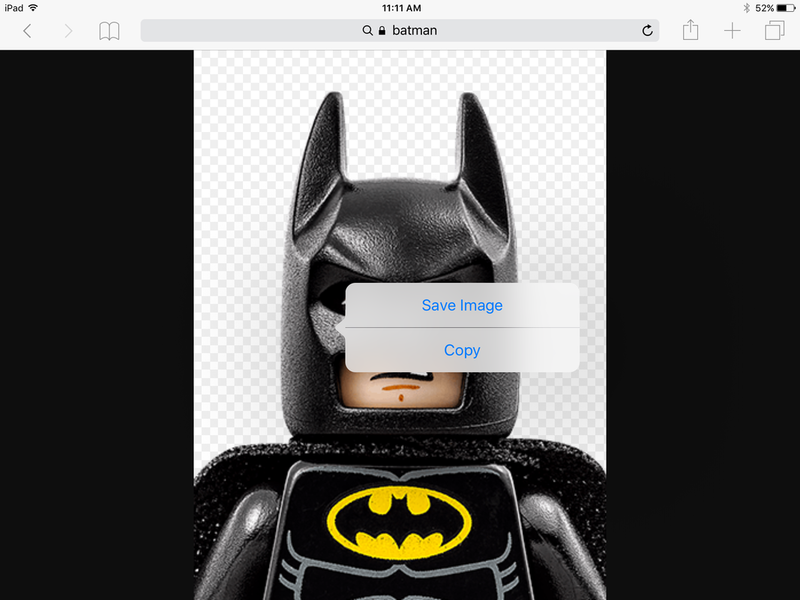 To add pictures or videos to your project, tap the Add button in the top right corner to open the Media Settings. At the bottom of the page, there are two small icons: Media and Audio. Tap on the Media icon (media browser shown in the image to the right). You will then be prompted to select one of five media sources: Moments, Video, Photos, Albums and iCloud Drive. Note: You can also access media stored in your Google Drive. 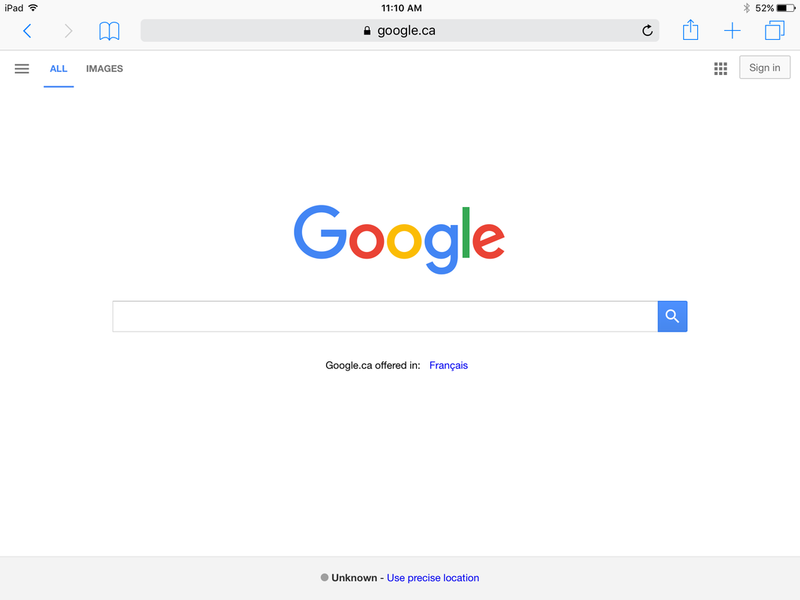 Open a search engine such as Google. 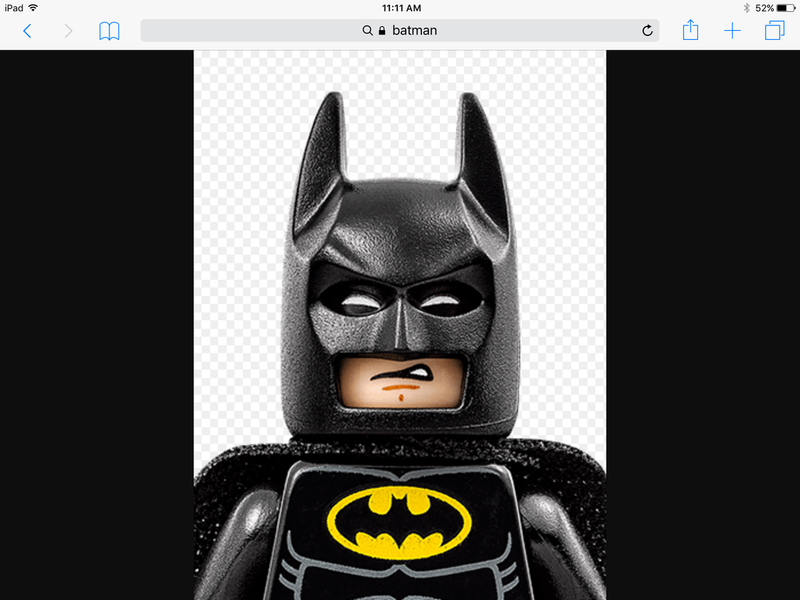 In the example above, we have used 'Batman' for our search in Google. 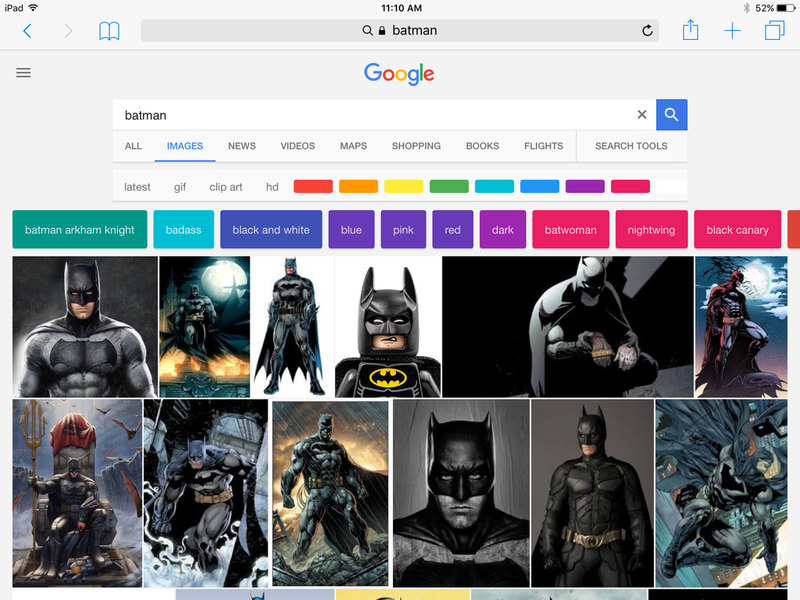 We are going to select Google Images to show us only images related to our search. Click on the image you wish to save once. It will open the image in a larger view. Hold down on the image until a window pops up offerining you to either Save Image or Copy. You are going to want to select: Save Image. It will default to your Photos and now is accessible to be included in your project. To add audio to your project, tap the Add button in the top right corner to open the Media Settings. At the bottom of the page, there are two small icons: Media and Audio. Tap on the Audio icon (audio browser shown in the image to the right). You will then be prompted to select one of the audio sources: Theme Music, Sound Effects, Playlists, Albums, Artists, Songs and iCloud Drive. ​The Timeline is where you edit your movie by adding, arranging and trimming video, audio, and photos. Swiping left or right on the timeline, called "scrubbing", lets you move through all the clips you've added to make your movie. Pinch two fingers closed on the timeline to zoom out and see more clips at once. Pinch out to zoom in for more detailed editing. Use the Play button to play your video. Tap the Previous Clip button to join back through the timeline clip by clip. When you select a clip in the timeline, the inspector appears at the bottom of the screen. The inspector includes a series of tools that will enable you to adjust the speed or volume of a clip, add titles and apply filters. To use the inspector, select the type of edit you want to make: Actions, Speed, Volume, Titles, or Filters. The location of the playhead determines where media drops into the the timeline. To reorder a clip, begin by tapping and holding the clip you wish to move. Then drag the clip left or right to the desired location in the timeline. Once a clip has been added to the timeline, it can be trimmed. Begin, by tapping on the clip in the timeline. 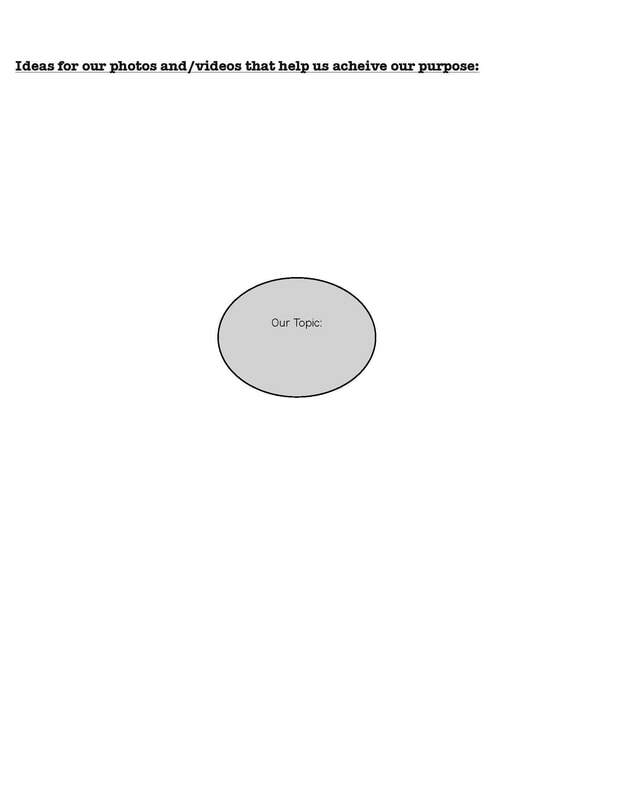 The clip will become outlined in yellow. Make sure Actions is selected in the inspector. The ends of the clip will both of a thicker line called the left trim handle and the left trim handle. Select the trim line you wish to cut. Move the trim line either away from the clip to lengthen the clip to reveal more video (if the video recorded has more video) or move it away from the clip to shorten and remove parts of the video. iMovie allows you to edit the speed of a clip. You can change the speed to go in slow motion or fast. In the timeline, tap on the video you wish to adjust to edit. Then, tap Speed in the inspector. The clip will have a yellow bar that you can adjust to select where you wish to edit the speed. In the inspector, you can can scroll to reduce or increase the speed of the highlighted clip. When satisfied with your changes select Add (bottom right corner). If unsatisfied with the changes select Reset (bottom right corner). Tip: Zoom into the timeline to pinpoint the exact spot to change the speed. 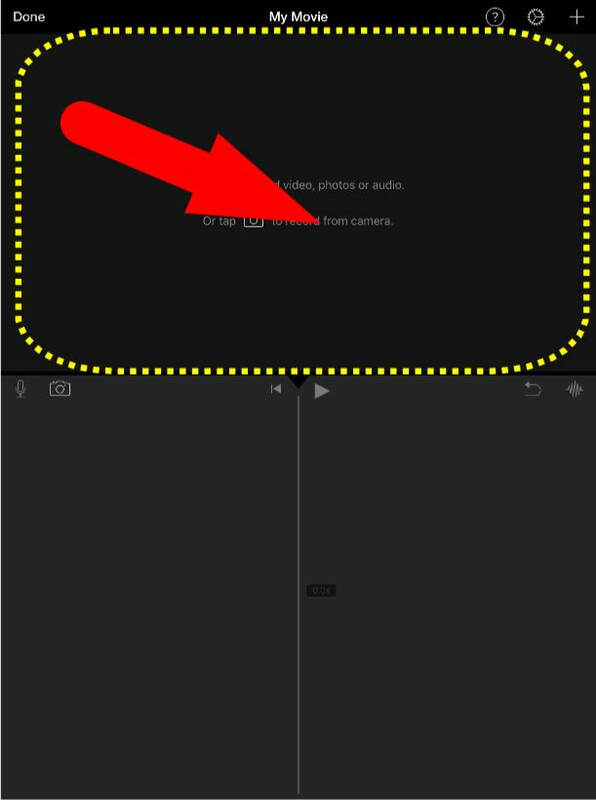 iMovie inserts defaults to include a dissolve transition between clips or images in your timeline. To modify a transition, tap the transition button between any clip. The transition button looks like to arrows pointing at one another. Length of Transition: You can change the length of the duration by selecting from the following options: 0.5s, 1.0s, 1.5s, or 2.0s. Type of Transition: You can choose between the following transitions options: None, Theme, Dissolve, Slide, Wipe, or Fade. iMovie allows you to add a video overlay that can display two videos at once, like a picture-in-picture or a side-by-side effect. Insert your first clip to the presentation. In the timeline, position the playhead to where you wish to add the additional clip. Next, go to the Add button (top right corner) to open up the media library. From the media library, select a clip you wish to add for overlay. A box will appear under the clip with three icons: an addition symbol, a play symbol and three-dots (ellipses). The addition symbol allows you to add the clip (however the clip will go to the end of the timeline and cannot be used for the overlay). The play symbol allows you to preview the clip before adding. The ellipses will reveal the option to add the audio only from the clip, to replace the current clip, to add the clip as an overlay (picture-in-picture effect) or to add the clip beside the other clip (side-by-side effect). 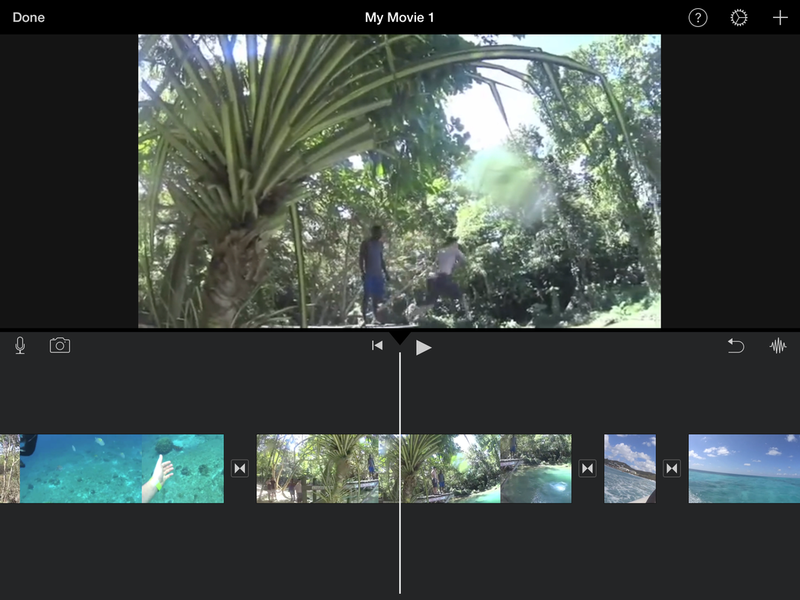 iMovie allows users to to split a single video clip. In the timeline, position the playhead to where you wish to slit the clip. Tap on the clip to be edited for the inspector to appear. Select Actions from the inspector and then select Split. Tip: Split videos to remove unwanted sections or to add different text to different parts of a clip. 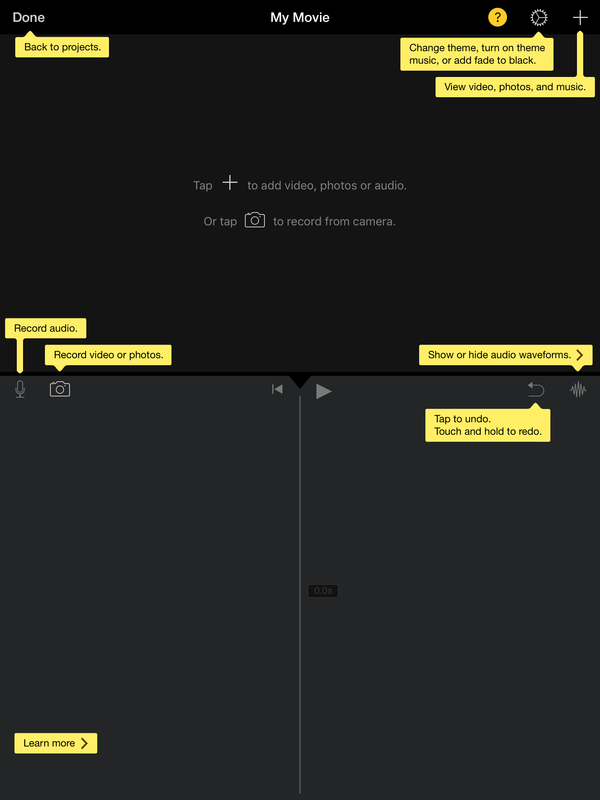 iMovie allows you to add voice recordings or other sounds to a presentation. Begin, by positioning the playhead where you wish to begin the recording. Then, tap the Record Audion button located on the left-side of the screen ( it looks like a microphone). A Ready to Record box will pop up. Tip: You may want to practice speaking until you find an appropriate speaking level. You want to avoid speaking in the red zone. Tap Record (in red font and can be found in the Ready to Record box). 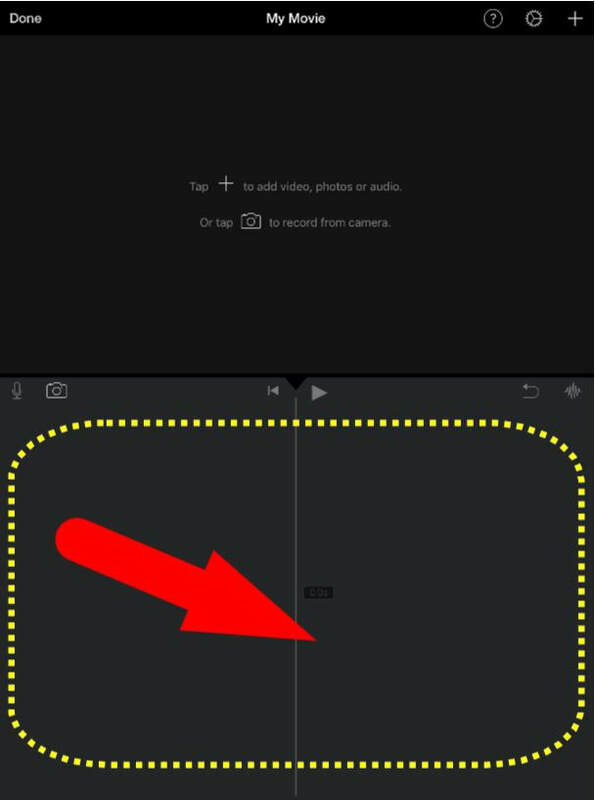 iMovie will count you down when you are to begin speaking. ​When you wish to stop recording select Stop (located in the Ready to Record box). A box will pop up titled Recording Finished. You can choose to Cancel the recording, Retake the recording, Review the recording or Accept the recording. A blue bar will appear below the video clip. This is the new recording. You can change the location of the recording bar by simply taping and dragging it to the desired location across the timeline. While the recorded bar is selected you can also choose to trim it, speed it up, or change the volume on the clip. 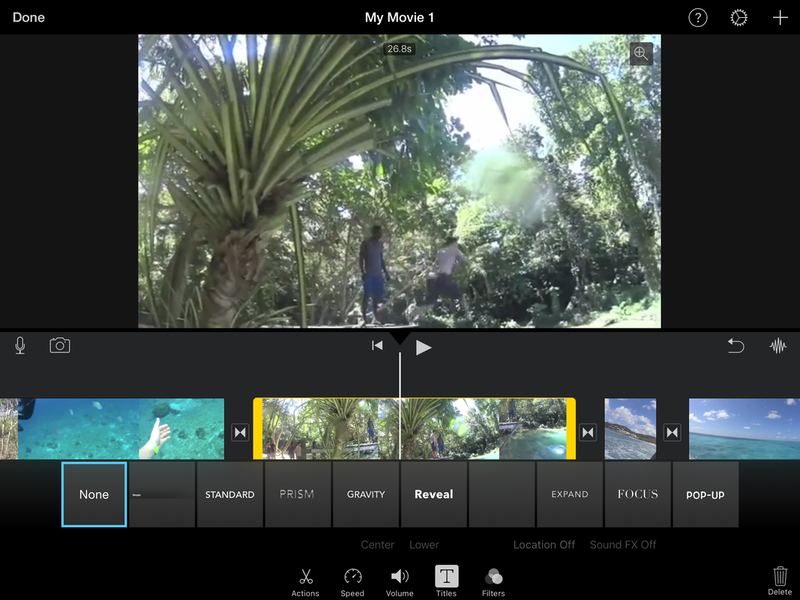 iMovie allows you to add text to any video clip or photo in a project. Tap the clip or image from the timeline that you wish to add text to. Then, tap the Titles button in the inspector and choose the desired text style. Under the title types you can select to either Center or Lower the text. Note: Text remains onscreen for the duration of the video clip or photo unless you edit the length. Access to iCloud is disabled on DPCDSB iPads. You may wish to consider either using the AirDrop feature to share a finished product to a personal Apple device or my preference would be Google Drive. Note: There is nothing to prevent a different user from going onto the iPad and editing or deleting an iMovie project. In short, the version of iMovie that we have does not allow us to access a green screen feature within it. However, the DP App Store does have an app called Do Ink that does! All you need is a green screen to get started. You can make one out of green material. In the past I have made them out of construction paper, bristol board, a sheet from Fabricland. ​One can complete a green screen video in Do Ink and then open up the published video in iMovie. 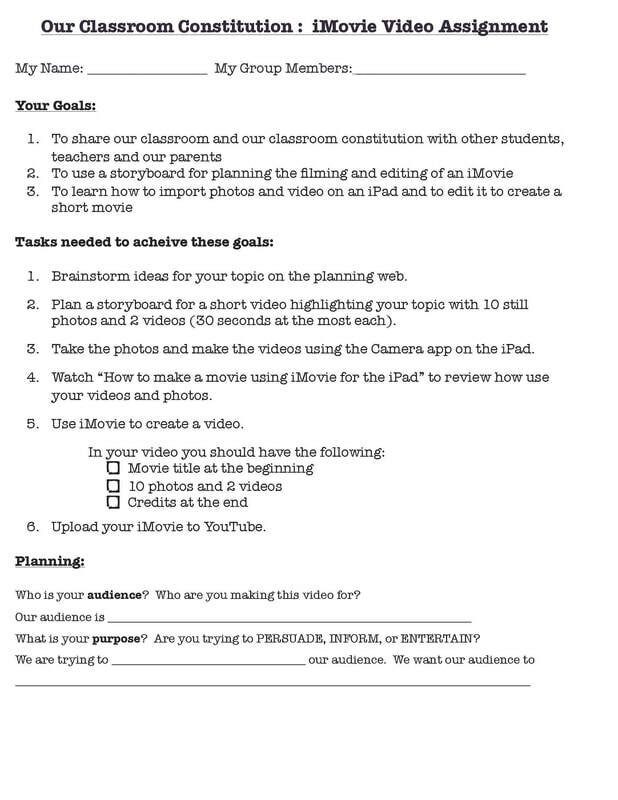 Once in iMovie, the video can be added to any presentation. Here is a link to the Do Ink site that explains more about green screening. Canada’s Copyright Act was updated in 2012 to include ‘education’ as a purpose under the fair dealing provision. “This means that anyone may claim the defence of fair dealing when using copyright materials for the purpose of education. It does not mean, however, that any use for education by anyone or by any educational institution is automatically allowed without permission from the copyright owner.